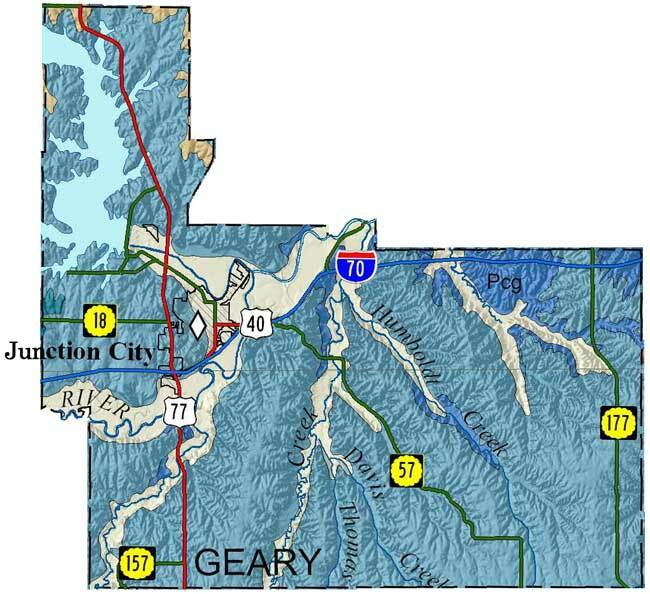 Copies of the Geary County map are available from the Kansas Geological Survey at 1930 Constant Ave., Lawrence, KS 66047-3724 (phone 785-864-3965, email pubsales@kgs.ku.edu) and at 4150 W. Monroe St., Wichita, KS, 67209-2640 (phone 316-943-2343, email wwsl@kgs.ku.edu). The cost is $15 plus shipping and handling. Inquire about shipping and handling charges and, for Kansas residents, sales tax. The Kansas Data Access and Support Center (DASC) has ArcInfo coverages available for this generalized geologic data.